The patrol leaders' council, not the adult leaders, is responsible for planning and conducting the troop's activities. 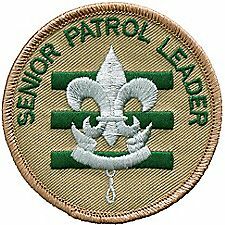 The patrol leaders' council is composed of the following voting members: senior patrol leader, assistant senior patrol leader, patrol leaders, and troop guide. At its monthly meetings, the patrol leaders' council organizes and assigns activity responsibilities for the weekly troop meetings. The troop's activities are selected and planned at the annual program planning conference. The troop's yearly plan is then submitted to the troop committee for approval. The troop committee either approves the plan or makes alternative suggestions for the patrol leaders' council to consider. The troop committee interacts with the patrol leaders' council through the Scoutmaster. Runs all troop meetings, events, activities, and the annual program planning conference. runs the Patrol Leader's Council meeting. Appoints other troop junior leaders with the advice and counsel of the Scoutmaster. Assigns duties ad responsibilities to junior leaders. Assists the Scoutmaster with Junior Leader Training. Must attend 85% of Troop Activities. Appoints the Assistant Patrol Leader. Represents the patrol on the Patrol Leader's Council Plans and steers patrol meetings. Helps Scouts advance. Acts as the chief recruiter of new Scouts. Keeps patrol members informed. Knows what his patrol members and other leaders can do. Must attend 85% of Troop Activities. Helps the Patrol Leader plan and steer patrol meetings and activities. Helps the Patrol Leader keep patrol members informed. Helps the patrol get ready for all troop activities. Represents his patrol at Patrol Leader's Council meetings when the Patrol Leader cannot attend. Lends a hand controlling the patrol and building patrol spirit. This position does NOT qualify for Star, Life, Eagle positions of responsibility. member of the Patrol Leader's Council. Attends and keeps a log of Patrol Leaders' Council meetings. Records individual Scout dues payments, permission slips, and activity fees. Records individual Scout attendance and uniform inspections. Works with the Troop Committee members responsible for advancement records and finance. Assists the Troop Chaplain with religious services at troop activities. Leads discussion on Saints during Scout is Reverent segment of troop meetings. Tells Scouts about the religious emblem program for their faith. Makes sure religious holidays are considered during troop program planning. Helps plan for religious observance in troop activities. Introduces new Scouts to troop operations. Guides new Scouts through early Scouting activities. Shields new Scouts from harassment by older Scouts. Helps new Scouts earn First Class in their first year. Teaches basic Scout skills. Coaches the patrol leader of the new Scout patrol on his duties. Works with the patrol leader at Patrol Leaders' Council meetings. Assists the Assistant Scoutmaster with training. Counsels individual Scouts on Scouting challenges. Gathers pictures and facts about past troop activities and keeps them in a historical file, blog, or scrapbook. Takes care of troop trophies, ribbons, and souvenirs of troop activities. Keeps information about former members of the troop. Writes at least one newsletter every 6 months. Teaches basic Scouting skills in troop and patrols. Providing specialized training is typical for this leadership position. Functions as an Assistant Scoutmaster. Performs duties as assigned by the Scoutmaster. Knows the purposes of Cub Scouting. Helps Cub Scouts advance through Cub Scout ranks. Encourages Cub Scouts to join a Boy Scout troop upon graduation. Assists with activities in the den meetings. Is a friend to the boys in the den. Helps out at weekly den meetings and monthly pack meetings. Meets with adult members of the den, pack, and troop as necessary. Represents the Troop at OA Lodge and Chapter meetings. Assists in setting up Troop OA elections and encouraging Ordeal candidates to attend Ordeal. Encouraging Troop participation in OA activities and for Ordeal members sealing their Brotherhood. Ensures that OA Business is NOT discussed with non-members except to explain the purpose. Other matters go before the Scoutmaster. Supports the online communication needs of the Troop Responsible for website design, content, and privacy. Presents to adult what is to be posted; an adult oversees publishing. Conducts Internet Safety Class.